Swiss Chard comes in a variety of colors. It is related to beets and spinach and has both bitter and salty flavors. Chard tolerates poor soil, inattention and holds up well in frost and mild freezing conditions. It can also be planted in shady parts of the garden. Outstanding Features: Swiss Chard doubles as a beautiful fall and spring edible ornamental vegetable. Swiss Chard is very cold hardy and, if planted in the fall, will survive the winter. Tips: There are recipes for cooking Swiss Chard on-line. 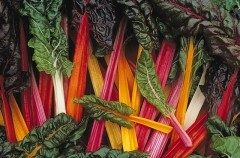 Here is a link to one on AllRecipes.com http://allrecipes.com//Recipe/simple-swiss-chard/Detail.aspx. Also the youngest leaves are going to be the most tender and tasty.